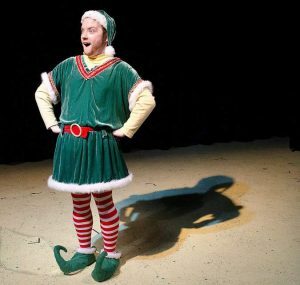 Patrick Lennon stars in The Santaland Diaries (Joe Mantello’s stage adaption of the David Sedaris essay) as part of 18th and Union’s “Cracked Christmas” programming. The production doesn’t quite live up to the script, but this one-man show is guaranteed to raise the spirits of anyone feeling not so merry and bright this holiday season. Patrick Lennon is at his best when he’s most enthusiastic – obsessing over soap operas, crushing on a fellow elf, and delighting in causing small chaos. However, he doesn’t pull off the darker side of the Sedaris character, and most of his impressions of other characters could be better. Still, he looks the part perfectly, and tells the story in an effective and fun way.The rest of the production also supports the strong script. There is some of the awkward staging typical of one-man shows, but Kelly Kitchens’s directing is effective overall. The changing in and out of the elf costume is a visual highlight. The timing of the sound and lightning was off at first, but soon got on track and added fun comic punctuation. 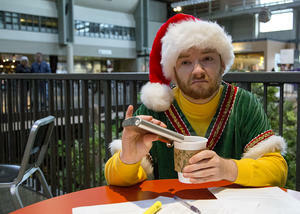 The Santaland Diaries isn’t technically flawless, but it’s funny, it’s fun, and it has heart. I recommend it to anyone feeling fed up with holiday season hype, consumerism, and stress. The Santaland Diaries by David Sedaris, adapted by Joe Mantello. 18th and Union, Central District, 1406 18th Ave, Seattle, 98122. December 1, 2, 3, 5, 15, 17, 22, 24: 7:30 pm. Tickets: https://web.ovationtix.com/trs/pr/966732 Info: http://18thandunion.org/the-santaland-diaries or 206-937-6499.